Why DO Liberals Hate Columbus Day? 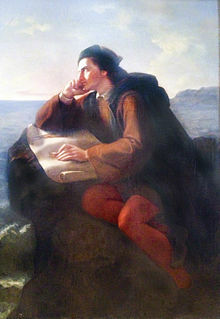 Was Christopher Columbus a handsome dreamer? Or is this mere propaganda? Some in the Catholic Church would love to canonize Christopher Columbus as a saint, while Liberals and Native Americans seek to depict him as a brutal xenophobe. The truth is quite a bit more complex, but we shall explore the absurdities attending the Liberal hatred of the controversial Italian explorer. That is how it opens right there, and for as much as the author (DJ Pangburn, I don’t know if “DJ” is his name or it’s a title because he spins fire mixes with this hot takes) would like us to believe that the truth is more complex he spends several paragraphs showing that SPOILER ALERT no, it’s not.